LSU football coach Ed Orgeron speaks during SEC football media days this past summer in Atlanta. Several days have passed since college football's regular-season game of the year turned into Alabama's 29-0 smothering of LSU inside Tiger Stadium. LSU coach Ed Orgeron was quick to praise the top-ranked Crimson Tide after Saturday night's slaughter, and his view of them has not changed. 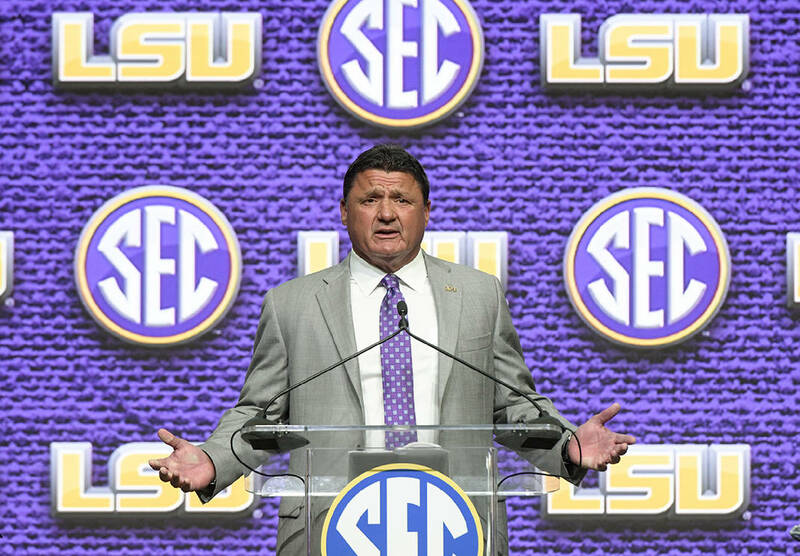 "It's one of the best football teams I've ever played," Orgeron said Wednesday during the weekly SEC coaches teleconference. "They have a great quarterback, and, overall, I don't see any weaknesses on that football team — the way their receivers caught the football, the release of Tua (Tagovailoa) and his escapability. "Their defense is dominant. It's a great football team." The Tigers lost for an eighth consecutive time to Alabama, but now Orgeron must make sure that setback doesn't whip them twice when they play at Arkansas — the only Southeastern Conference team without a league win this season — on Saturday. LSU drubbed the Razorbacks 33-10 last season, which was Orgeron's first full year at the helm for the Tigers, and beat them 38-10 two years ago, when Orgeron was the interim coach after Les Miles was fired four games into that season. Miles was just 4-5 against Arkansas after facing Nick Saban's Tide. "I don't know what the weather is going to be, but it's obviously going to be cold," Orgeron said. "We have to block that out and get back on track. LSU has struggled after the Alabama game for years, but in the last two years we've had success. We need to be careful we don't have a hangover and that we respect Arkansas. "They put 31 points on Alabama, and we didn't put any." LSU, which dropped from No. 3 to No. 7 in the College Football Playoff rankings released Tuesday, closes out its regular season against Arkansas, Rice and Texas A&M. The Aggies are the toughest of the three but have yet to defeat LSU since joining the SEC in 2012, losing to Orgeron's Tigers 54-39 two years ago and 45-21 last November. Should LSU finish 10-2, the Tigers will be coveted by New Year's Six bowls not involved in this year's playoff. They may not have been good enough to stay on the field with Alabama — nobody has to this point — but they've proven to be much better than expected. LSU was picked before the season to finish fifth among SEC West teams and projected to go 5-7 in ESPN's Football Power Index. South Carolina at Florida: The post-Tebow Gators have quarterback uncertainty in November? No way! Gators 20, Gamecocks 16. Vanderbilt at Missouri: The Commodores trailed the Tigers 35-0 at halftime of last year's matchup. Tigers 31, Commodores 24. Mississippi State at Alabama: The Tide are seeking their 24th consecutive home win, which would match the program mark set from 1971 to '74. Crimson Tide 45, Bulldogs 13. Kentucky at Tennessee: Mark Stoops has matched or exceeded his victory total each season since arriving in Lexington. Wildcats 16, Volunteers 13. Miami at Georgia Tech: Mark Richt is not trending in the same direction as Mark Stoops, as Richt's Hurricanes are 5-4 a year after being 9-0. Yellow Jackets 35, Hurricanes 28. Auburn at Georgia: It's the first matchup of coaches with seven-year, $49 million deals in SEC history. Bulldogs 33, Tigers 10. Mercer at UTC: The Mocs have a chance to collect seven wins in a season for the fifth time in six years. Mocs 24, Bears 21. LSU at Arkansas: The Tigers are 7-0 under Orgeron after a loss, with the seventh win being last month's upset of Georgia. Tigers 31, Razorbacks 16. Last week: Winners — 19; Carville theories — 6. Pasquali is 192-58 overall (76.8 percent) this season.